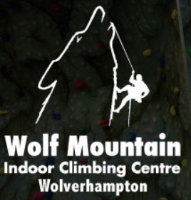 The Centre has top rope, bouldering, abseiling and lead climbing walls. In addition to this, there is an indoor caving system, archery gallery, conference room for hire, designated climbing area for kid's parties and two themed party rooms. We also offer mountain biking, team building, kayaking and canoeing. For the less energetic visitor or spectator, there is a cafe and several sit down viewing areas. Situated near to the City Centre, Wolf Mountain is easily accessible by public transport and for those choosing to drive, there is ample free car parking provision. School groups, other activity companies and instructors will still be able to access the centre at earlier times by prior arrangement. Centre is open at 10am durung school holiday periods. Please call 01902 711186 for more information.